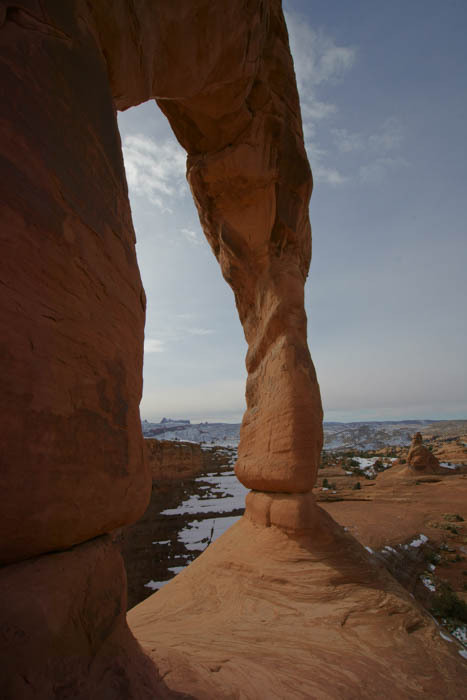 Delicate Arch is the ultimate hiking destination in Arches National Park. No other rock formation is more recognizable in Utah, and maybe the entire country, and to visit Arches without seeing it would be a shame. Because it’s iconic, it’s also popular — and big crowds can take away from the experience. 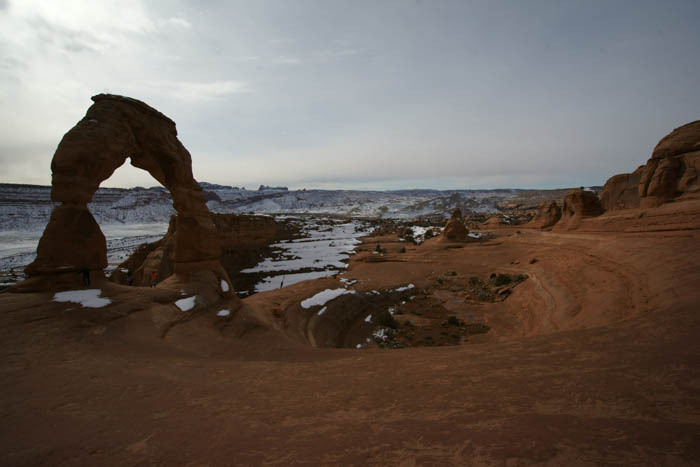 The only surefire way to (almost) have the place to yourself is to hike out to Delicate Arch in winter. And as a bonus for visiting in the least convenient time of year, you might get to see the arch covered in snow. Delicate Arch is located inside Arches National Park, just north of Moab, Utah. Enter the park and take the scenic park road for about 12 miles, then turn right onto the road that leads out to Delicate Arch. There are three hiking options — but the trail that takes you closest to Delicate Arch begins about halfway out this road, on the left. 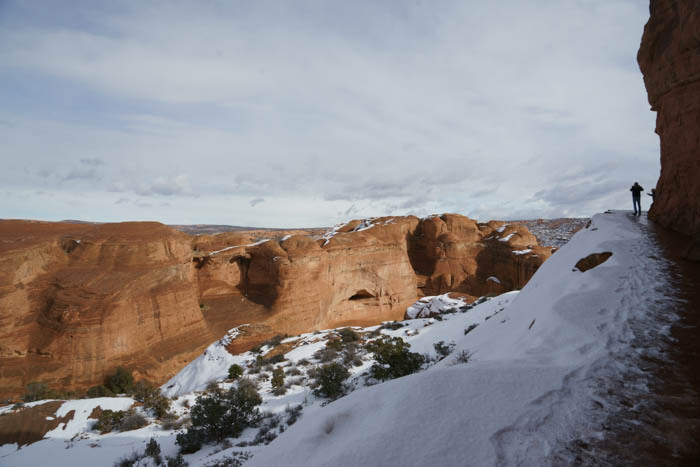 My morning had started out with a couple of inches of snow falling on Arches National Park, and I really hoped to squeeze in as much sightseeing as I could before it started to melt. Unfortunately, by the middle of the day, much of that snow was already disappearing. Even so, I decided it would be a good idea to hike out to Delicate Arch and hope that there was still a dusting on the ground. 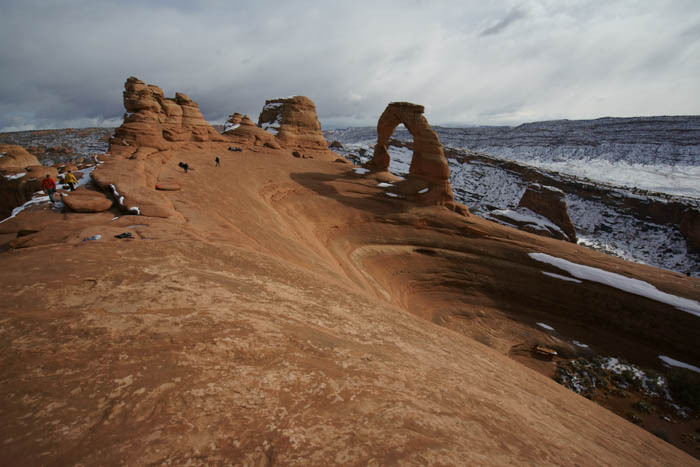 The hike up to Delicate Arch is 1.5 miles, one way, with an elevation gain of 480 feet. It’s not a terribly hard trail, but there are a few spots where it’s tricky to follow, as you cross slickrock marked with cairns. Even though I was still wearing my snow boots and traction chains, the first part of this trail was completely snow and ice-free. So, I took off the chains (and stripped off a layer or two of upper-body clothing) until I got to the part of the trail you see above — and then I put those layers back on, and re-attached my traction devices. This final part of the trail is shady and, in January, it will probably be icy, whether or not it snowed on the day of your visit. I saw a few people slipping and sliding on this part of the trail, so come prepared. Now, the most significant thing to notice in this picture is not Delicate Arch, in and of itself. It’s not the surrounding scenery, which is also quite stunning. The thing to notice is the almost total lack of people. Stand in this spot in June and there will probably be a few hundred people who have staked out a spot on the edge of that sloping bowl. You can forget about getting a picture of just the arch — there will always be someone standing under it or near it. And that’s why you need to visit in January. Or maybe February. With so few people around, it’s pretty easy to walk around and get some pictures of Delicate Arch from alternative angles. You might have to wait for one or two people to get out of the way, but there’s no need to be in a hurry. Just be careful as you walk around — the slanted surface of the rock is deceptive, and you can suddenly find yourself in a spot that’s too steep. And you really don’t want to take a tumble down to the bottom. … and underneath it. 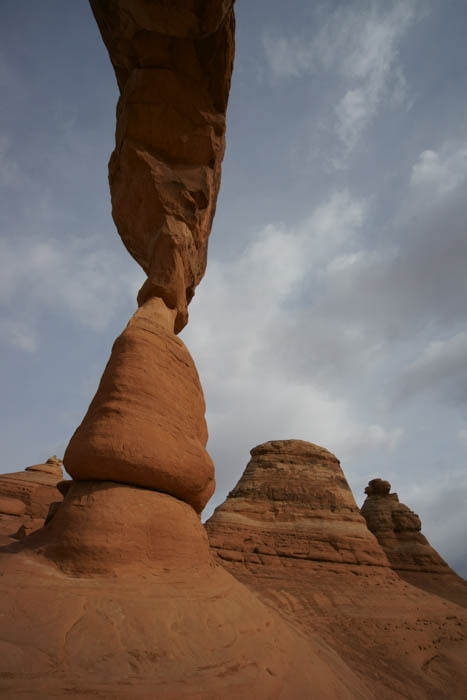 The most familiar natural landmark in Utah suddenly looks completely different! I grabbed a comfortable spot and relaxed here for a while. The sky wasn’t perfect for photography — I’ve seen many much more beautiful photos taken up here. And, I was disappointed that there wasn’t more snow sticking around from that morning’s storm. But, the surrounding hills were still frosted. And best of all… the solitude. The hike back follows the same path that you arrived on — another 1.5 miles back to the trailhead. As you leave, keep an eye out for an alternative route off the trail. I’m not sure if there’s any official path, or even if the park service discourages hikers to explore — but there is a way to hike out to the other side of that bowl, and get a different perspective on Delicate Arch. If you do find a way out there, remember how you did it, and how to get back, because it is easy to get off-track on this trail. You can also check out my previous visit to Delicate Arch, during warmer weather, here. 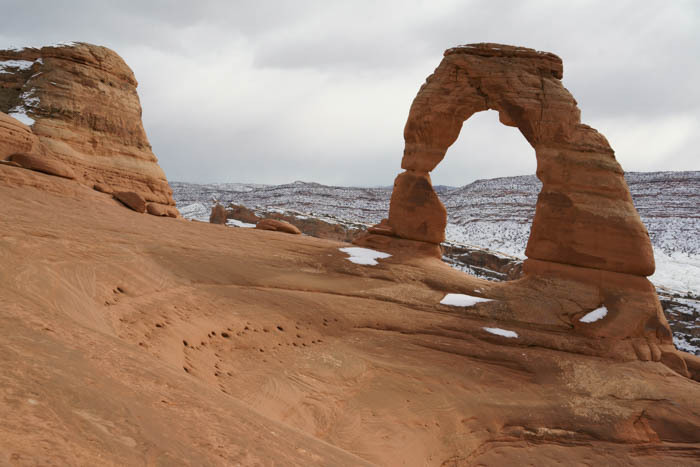 If you can make the hike out to Delicate Arch, you should do it, any time of year. 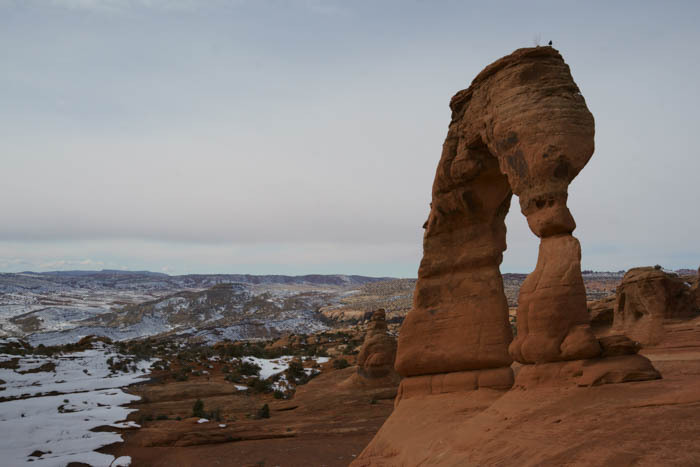 But, if you can visit the park during the winter, and hike out to Delicate Arch when there’s some snow on the ground, you’ll enjoy a very special experience, with some rare solitude at this popular destination.